Instead of using File Explorer to navigate through the computer’s folders to find files in your computer, you can create a desktop shortcut that allows you to quickly open or access files, folders or programs. A desktop shortcut is an icon on your Desktop that opens an associated program, file, or folder when you double-click the icon. To create desktop shortcuts in Windows 8.1 and 10, use a File Explorer window to navigate to the folder, file, or program for which you want to create a desktop shortcut, so that the item is displayed in the right pane within File Explorer. Then, right-click the item for which you want to create a desktop shortcut. Roll your mouse pointer over the “Send to” command in the pop-up menu that appears and then click the “Desktop (create shortcut)” command in the side menu that appears. Windows will automatically add a shortcut to the selected item to the desktop. The icon for the desktop shortcut appears within your Desktop with a small arrow in the icon’s lower left corner. That is how you can tell that the icon is a desktop shortcut to a file, and not the actual file itself. It is fine to delete desktop shortcuts by dragging them into the Recycle Bin. That will not delete the file that the shortcut refers to, but rather the desktop shortcut itself. 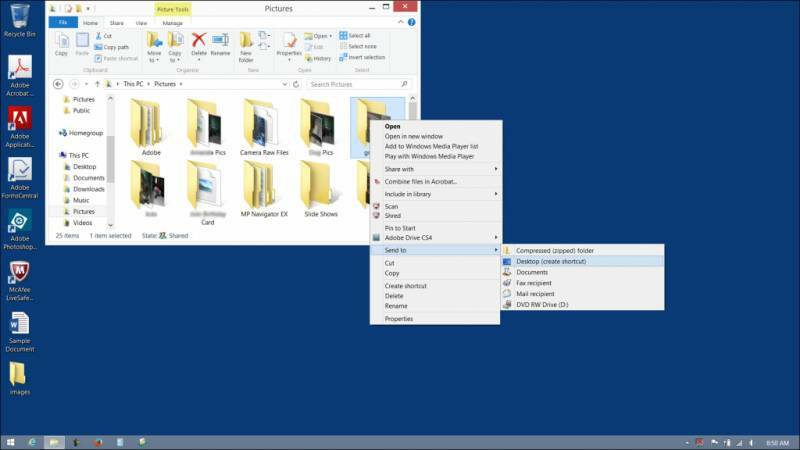 To create desktop shortcuts in Windows 8.1, use a File Explorer window to navigate to the folder, file, or program for which you want to create a desktop shortcut, so that the item is displayed in the right pane within File Explorer. Right-click the item for which you want to create a desktop shortcut. Roll your mouse pointer over the “Send to” command in the pop-up menu that appears and then click the “Desktop (create shortcut)” command in the side menu that appears to automatically add a shortcut to the selected item to the desktop. To delete a desktop shortcut, click and drag the desktop shortcut into the Recycle Bin. That will not delete the file that the shortcut refers to, but rather the desktop shortcut itself. If you’re struggling with your version of Windows, why not call me in for a tailor-made 1-1 tuition session?